Tag Archive | "National Trails Day"
Each year the American Hiking Society hosts events all over the nation to highlight the importance of the national trails system. The North Country Trail hosts the event in West Michigan. 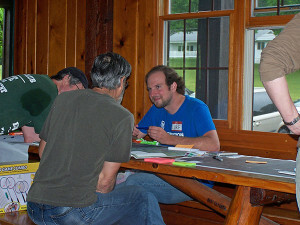 This year, because of the new relationship between Cedar Springs and the North Country Trail, the event was held last Saturday at nearby Long Lake Park. It was a rainy day, sometimes in a nice way, and sometimes in a ferocious way. But that didn’t stop over 100 people from showing up, eating a hot dog, a piece of homemade sheet cake or pie, and joining in the fun! 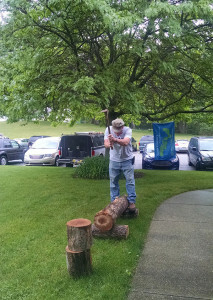 Tom Noreen presented an informative and enjoyable demonstration of how logging was done in the past. Tom Mabie took several people on a fun, educational hike around the park and explained the medicinal properties of various plants. They came back drenched, but a lot smarter!! 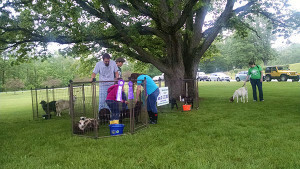 Double K Farms and Animal Junction 4H Club brought a petting zoo with chickens, Shetland Sheep, Pygora Goats, Boar Goats, an Angora Rabbit, mini rabbits and pigs. 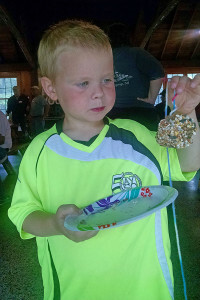 The 4H kids had a wonderful time showing their projects to everyone. 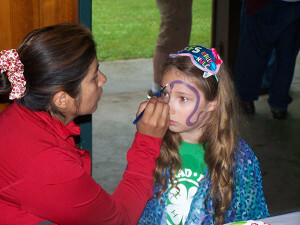 The Cedar Springs Library did face painting, made pinecone bird feeders and other crafts with the kids. Howard Christensen Nature Center brought many different animal skins for people to learn about and touch. 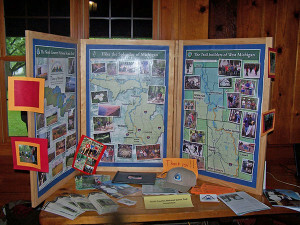 There was a Ham Radio demonstration as well as informational booths for the North Country Trail and the Community Building Development Team. As part of the Optimal Location Review, National Park Service representatives held conversations with local people to identify scenic, historical, or cool characteristics of our area as part of the process of getting the North Country Trail route certified through our area. 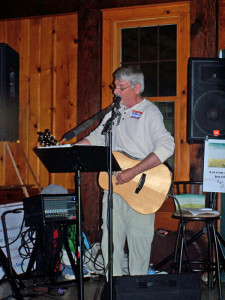 Local folk singer Bruce Matthews provided a perfect concert to cap the day. Local businesses donated several items, including door prizes, pop, water, gift certificates and popcorn. As the trail route is determined and certified, watch the Post to keep you informed and include you in other events to celebrate this exciting National Park called the North Country Trail being routed through our area. Welcome the North Country Trail to Cedar Springs by celebrating the American Hiking Society’s National Trails Day at Long Lake Park (in the pavilion), 13747 Krauskopf NE, (south off 17 Mile), from noon to 4 p.m. The event, hosted by the Cedar Springs Community Building Development Team and North Country Trail, will be fun for the whole family. 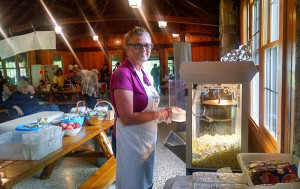 They will offer hot dogs, ice cream, a petting zoon, games, music, popcorn, face painting, a ham radio demonstration, a guided hike on the North Country Trail at 3 p.m., a chance to identify medicinal plants, and a history of logging in northern Kent County. Residents will also get to offer ideas on what cool sites hikers in the area should see.